Provides local and remote keyboard, monitor, mouse and RS232 access to a PC up to 600 feet via CAT5 cable. The VGA PS/2 KVM Extender provides local and remote KVM (PS/2 keyboard, PS/2 mouse and VGA monitor) and RS232 access to a PC up to 600 feet using CAT5/5e/6/6a cable. Supports TXD, RXD, DTR, DSR, CTS, and RTS. Multiplatform support: Windows 2000/XP/Vista/7, Windows Server 2000/2003/2008, Linux, and FreeBSD. One male 15-pin HD / two male 6-pin miniDIN connectors for PC. Female 9-pin D connector for RS232. 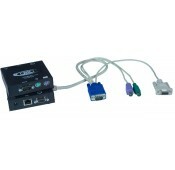 Male 9-pin D connector for RS232.